Divers may experience unintentional encounters with fire coral, jellyfish and other marine creatures. Any time a person enters the marine environment there is a chance of being stung, bitten or cut. 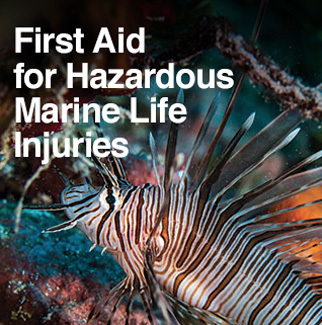 This course will teach you where you can expect to encounter potentially hazardous marine life and how to provide first aid when injuries occur. The more you know about the marine environment, the greater your chances of having safe, memorable dives. provides first aid skills to minimize these injuries and reduce discomfort.